When shopping for a color that pops and has fashion appeal, royal blue should go high on the list especially when it comes to slim fit dress shirts to wear with your slim fit suits and flat front pants. Marquis is a wonderful brand to buy because not only are they cheap in price but they are well made and last. 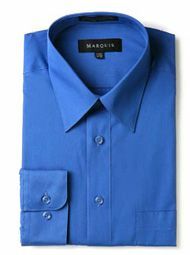 This royal blue slim shirt features a classic dress shirt style with chest pocket and barrel cuffs that are adjustable. Fabric is Cotton/Poly for easy care. Here is where you can find some of the latest Slim Fit Suits available.